It’s been quite a while since we’ve added new recipes on Living Chirpy and if you follow us on instagram, you may or may not have seen the announcement we made a couple of weeks ago. So, *drumrollll* -> Living Chirpy is expecting a Little Chirpy Baby this December! Luckily, at about 11.5 weeks along now, I think I am finally starting to see the light at the end of the tunnel (I hope). The nausea comes and goes, but today it’s finally gone enough to tackle some cooking – halleluyerr! My stomach is still a little fragile on what it can and can’t handle, so something fresh and simple is the best route to go by far. 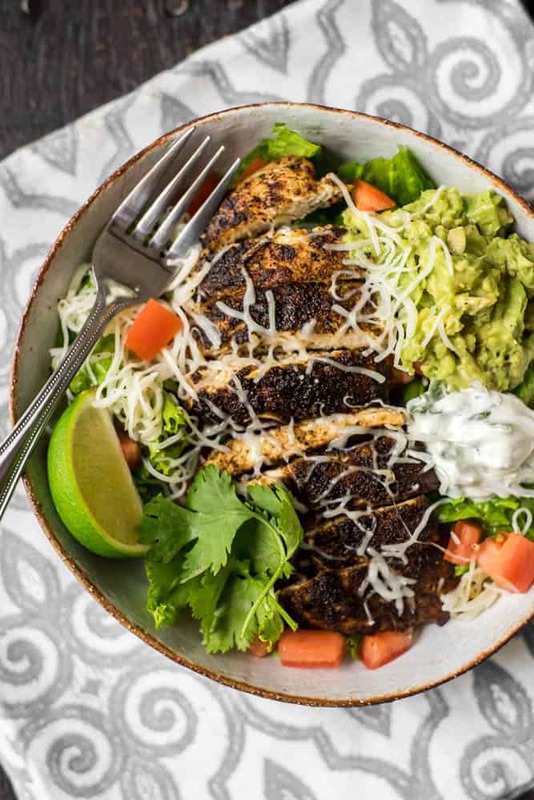 If my pregnant tastebuds think this is an awesome salad, you better believe that your non-pregnant tastebuds will think it tastes like a million bucks #science. 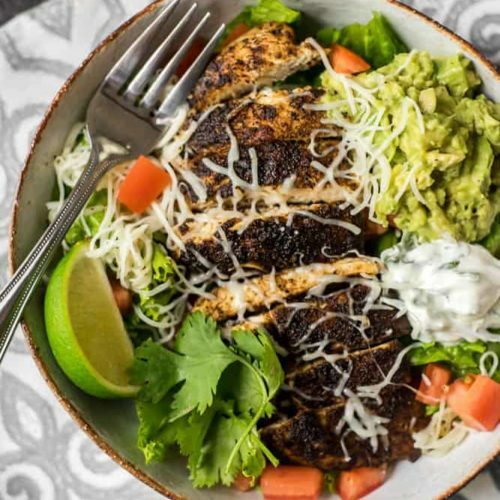 A bed of fresh shredded lettuce with little cubes of roma tomato, a deliciously succulent Chili Lime Chicken Breast, some mashed avocado, topped with a sprinkle of shredded mozzarella cheese and a drizzle of cilantro sour cream is all it takes to make our Chili Lime Chicken Salad. No complaints there – if I can throw this bowl of deliciousness together in 10 minutes, so can you! Season the chicken with the chili powder, ground coriander, salt and pepper. Ensure that the chicken is coated well with the spices. Add some lard to a medium hot pan and cook the chicken breasts about 2-3 minutes per side (depending on the thickness). 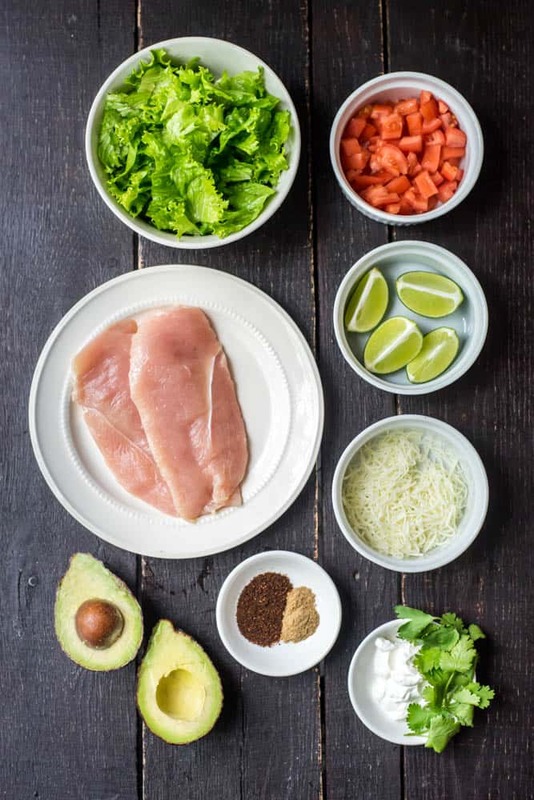 Once the chicken is cooked, squeeze 3 of the 4 lime wedges over the chicken and cut into strips. 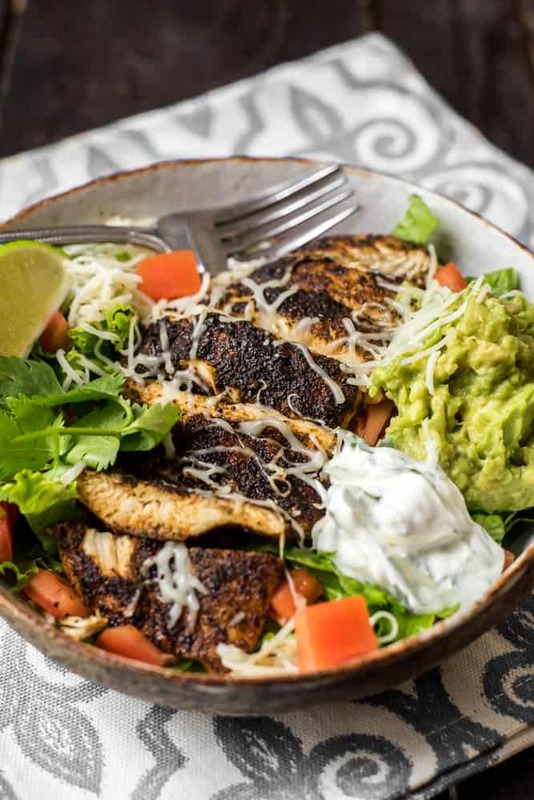 While the chicken cooks, mash the avocado with a fork and squeeze the remaining lime wedge over it. Season with salt and pepper. Mix the sour cream and the cilantro. Assemble the salad: divide the lettuce, tomato, avocado ,and sour cream into two bowls. Top with chicken and sprinkle with the mozzarella cheese. Stir it all together and enjoy!